I was looking through my "fall folders" and found the story, The Chocolate Chip Ghost, written by my daughter when she was about eight years old. As there were no blogs at that time, I was happy to borrow ideas from my children's classwork. Her teacher read the story about the little ghosts who ate various foods, turned the color of the food, and then, hid throughout the house so no one would see their colors. Students wrote a similar story with their choice of foods and hiding places. My students, who were just beginning to write, chose colors, matched food to the colors, and described hiding locations. We wrote the stories as a group, often using symbols paired with the words. Toy foods and food pictures were used for visual supports and students colored little white ghosts to match food colors. My daughter's story was written in 1995. Before writing this post, I searched the web and found two books titled The Chocolate Chip Ghost; both out of print - one written in 2004 and another in 2008. In addition to the books, I found several versions of this story and here are the links two favorites. The Chocolate Chip Ghost Folder Stories posted rovingfiddlehead. 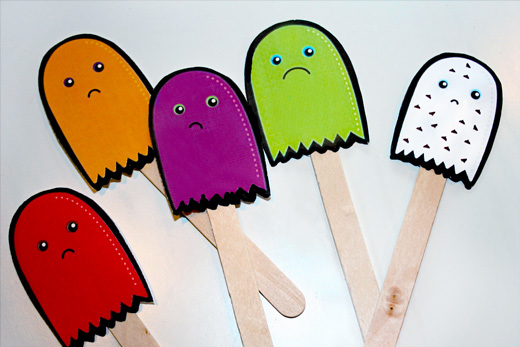 The story and free story props can be found at Sandy Toes and Popsicles; two versions of the adorable ghosts (white and colors), a mother ghost, food, and props for hiding locations. Use this story to teach spatial concepts (behind the door, in the bathtub, under the bed, etc. ), sequencing, and appropriate responses to questions such as What happened next?, Why is he green?, or Where is he hiding?